Rather than taking medicine orally, some people with acne problem may prefer for effective topical natural remedies. If you are looking for it, you may consider using jojoba oil for acne problem solution. In a long tradition of folk medicine, jojoba oil has been used for treating skin conditions including acne. Is Jojoba Oil Good For Acne? Jojoba oil isn’t an oil technically, yet a liquid wax product derived from jojoba tree (Simmondsia Chinensis) seeds. It has a golden color and a nice mild smell. The key properties of jojoba oil are including 45-50% of liquid wax ester which closely resembles the human skin’s sebum, 15% protein, 3% moisture, and the rest is a rich proportion of carbohydrates and fibers. The natural compounds provide antioxidant properties, like vitamin E compounds (tocopherols) that promote skin health, and antibacterial agents which effective against bacteria like Staphylococcus epidermis, Staphylococcus aureus and Propionibacterium acnes. Those are the bacteria which commonly contribute to the growth of acnes. Paradoxically, people mostly afraid to use oily products for their affected skin face that may clog their pores and end up worsen their acnes. However, jojoba oil is a wax ester which resembles the sebum. So, when you apply it, your skin will assume that the sebum amount produced is already high which means the skin won’t produce more sebum. When the production of sebum falls, the skin becomes less oily and lessen the symptoms of acne. The properties also provide antibacterial agents that fight against acne bacteria and cleansing action to clear the pores from pus which formed by dead skin cell, sebum, and bacteria. Last, the moisturizing ingredients also give a soothing effect that relieve your skin from itchy and inflamed redness caused by acne. The other great news from jojoba oil is, it is a non-allergic and non-toxic remedies which safe for your skin. It does not clog the pores or leave any greasy residue on your skin. Therefore, the symptoms of acne won’t be worse and the formation of blackheads will be less. For topical use of jojoba oil for your acne, you can follow these following instructions. Wash your face with warm water and cleanser gently to clear the clogged pores before drying it thoroughly. Use a cotton swab to apply the jojoba oil to the affected areas. Dab it gently and don’t scrub so it won’t get inflamed. Repeat the steps for 3 times a day in a few weeks period. In the beginning, you may experience some blackheads break out, however, keep continue the applying. It’s just a purging period when the oil drives out pus from the skin pores. You can try to combine jojoba oil with tea tree oil for more great result. Do it by mixing 1 teaspoonful of jojoba oil with 5 drops of tea tree oils. Ensure to store the oil in a sealed glass container in the refrigerator. 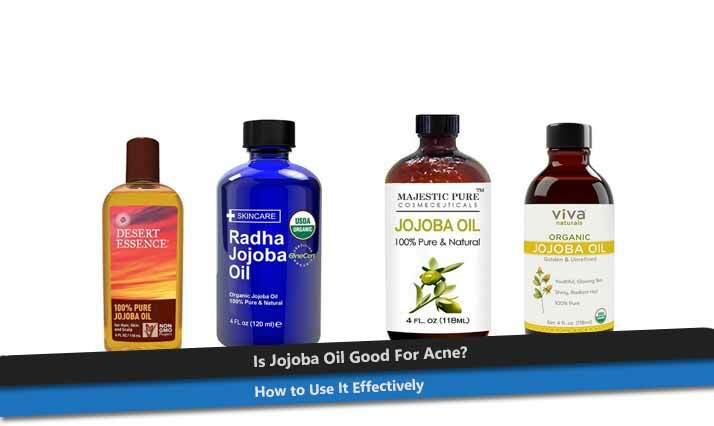 After all, jojoba oil is a good option for you who are looking for a natural remedy for your acne solution. While effectively fighting against your acne, the oil won’t give you any side effects which some of other acne treatment would give.